Kathy messaged me first online. She said she liked my profile and was in a hurry to meet, so I took her out bowling. While we sat in the lounge and hung out, she asked me, "Have you ever slept with a man?" I hadn't to my recollection and I told her so. Then she asked, "Have you ever slept with anyone?" "A woman?" she asked like she wouldn't believe it if I told her I had. "Oh my God," she said, "Who?" "Uh... someone from college. I doubt you'd know her." "Eww! You slept with Debbie Pfeifer?" I asked, "You know her?" "Know her? She's the skankiest ho in the state!" We were in Missouri. I reminded Kathy, "I went to college in Arizona and Debbie's from Washington." "You slept with someone from Washington? Ugh. Your standards must be real low." I sighed. "Clearly they are." Kathy didn't take the hint. Instead she said, "Washington's the skankiest state in America. I'm surprised at you." "How low I've sunk," I said, "How are you so well-aware of which states are skanky?" She said with a straight face, "I make it my business to know all things skanky." There you have it. We chatted pleasantly a bit longer before calling it an early night. I want to bed skank-less, although the conversation did inspire me to reach out to Debbie, and we still talk. Eww! You still talk to that skank?! Actually, Washington is pretty far down on the list, as we can see here. 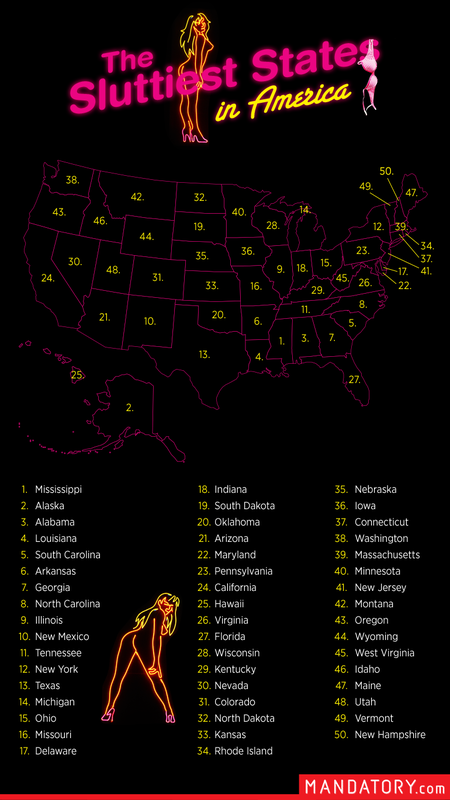 I mean Missouri is twice as skanky/slutty as Washington. It does, however, warm my heart to see that good old NC, my home state, made it into the top 10. Hahaha Architect - where in the Sam Hill do you find this stuff ?!? ^ The sad thing is, it's surprisingly easy.